Welcome to the TScore website! 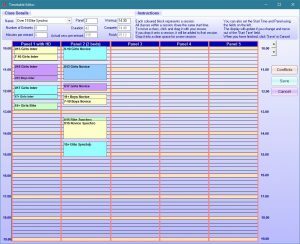 TScore is a computer program that helps you organise and run Trampoline, Synchro, DMT, Tumbling and Artistic Gymnastics competitions. It handles competition setup, entry processing, timetabling, scoring and results processing. TScore is highly intuitive and very forgiving – complete novice computer recorders can learn it in a few minutes. It is also we believe, the most feature rich product of its type on the market. Although simple to use, TScore is very sophisticated. 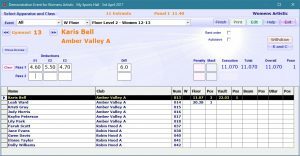 It can handle the latest BG, FIG and USAG rules and offers customisable results lists and personalised certificates. Since TScore is developed by a UK trampoline coach, and used at our regional comps, updates will be available whenever the BG rules change. It also includes specific adaptations for BSGA (Schools) competitions, with the ability to separate team and individual entrants running within the same classes. Automatic emailing of entrants makes handling communications with over 150 schools so much easier! Since 2015, we have supported USAG-JO scoring systems and in 2016 added Range and Conditioning scoring. TScore can support a range of non-English character sets for some of its functions. The newest version 10 adds the latest FIG changes to trampoline scoring – Horizontal Displacement. 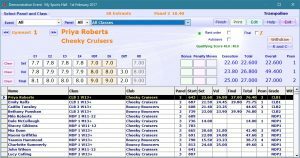 The bigger change though is that this version offers Artistic Gymnastics scoring, including multi-piece events, static competitor numbers and individual score tickets. The Trampoline, DMT and Tumbling parts of Version 10 are now fully released product. The Artistic Gymnastics section however should still be regarded as a demonstration or beta test feature, as we have not run full competition trials of this functionality yet. With our new product and a new website offering enhanced online support and a customer discussion forum, we are looking forward to a great year! P.S. If there are still things on the old website you ‘d like to see, they are still here. Please let us know what else you would like to migrate to the new site.